My experience as a member of the WS Bahamas team has given me the opportunity to take journalists on amazing adventures to Grand Bahama Island, the Abacos, the Exumas and coming soon, South Andros and Long Island. 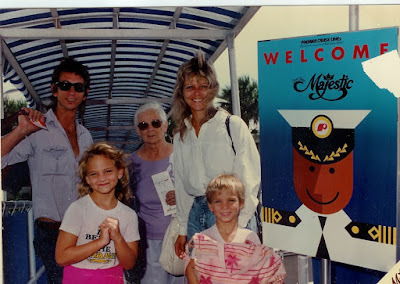 But I’ve recently come across a family photo that reminded me that press trips weren’t my first introduction to the island nation, its cruise ports or its ingenious branding campaigns. Pictured in this circa 1990 photo are my dad, great-grandma, mom, me and my younger brother. (Incidentally, Hodgie and I probably only stopped punching each other long enough to smile for the camera.) The picture captures the excitement of boarding our very first family cruise on now defunct Premier Cruise line. As my shirt says, I knew it was Better in The Bahamas way before I was paid to know it. My favorite part of the picture remains unseen. Hidden behind the big pink beach bag, my brother is sporting the same Bahamas shirt as me, because I told him he had to - and he's wearing shiny blue shorts that match my shiny pink ones. Nerd! It appears I joined The Bahamas team long, long before 2006.